As firefighters work to contain a deadly wildfire in Northern California, another fire is rapidly expanding, threatening new communities and prompting fresh evacuations. The Mendocino Complex Fire is now the second-largest fire in state history. Tricia Austin, public information officer for the Mendocino Complex, tells NPR the previous second-largest fire was the Cedar Fire in 2003, which burned 273,246 acres. The Mendocino Complex is now at 273,664 acres and continuing to grow. 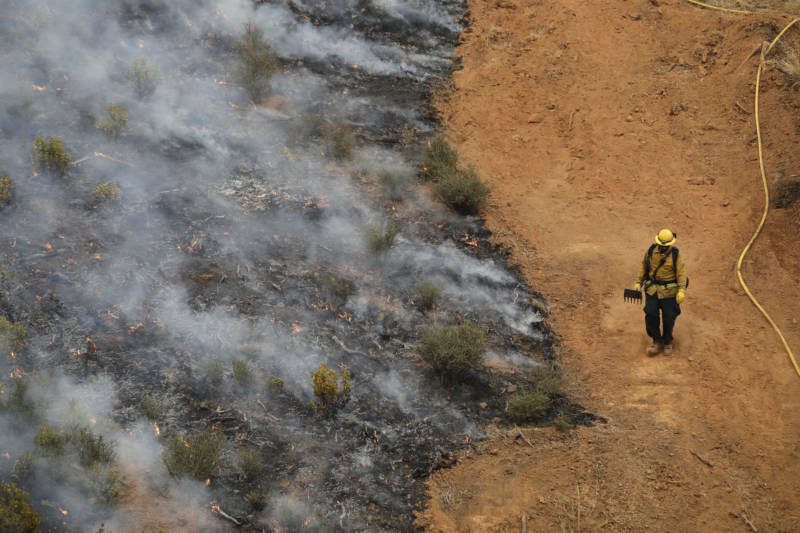 The largest fire in state history, last year's Thomas Fire in Ventura and Santa Barbara counties, charred 281,893 acres before it was contained. 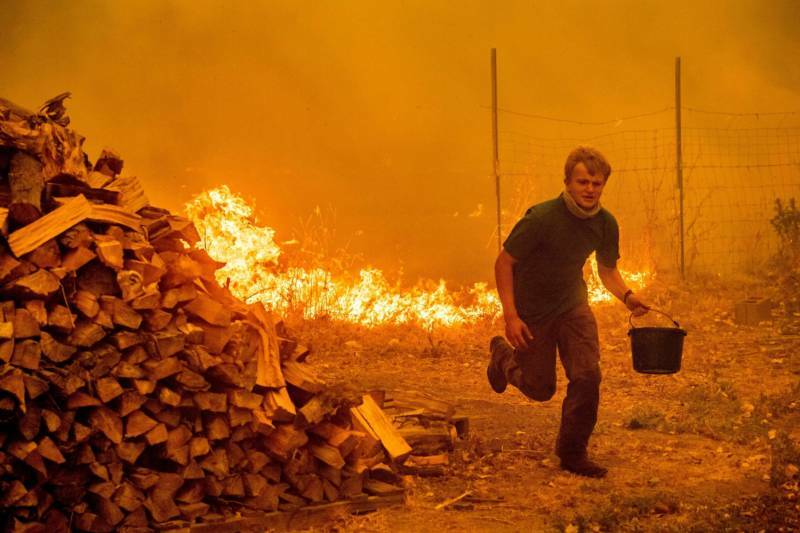 Meanwhile, other wildfires in California, Oregon, Washington and Idaho continue to burn vast swathes of land, firefighters have been stretched thin battling the numerous blazes. The headline-grabbing Carr Fire, located in Northern California near the city of Redding, is now 45 percent contained, according to the California Department of Forestry and Fire Protection. 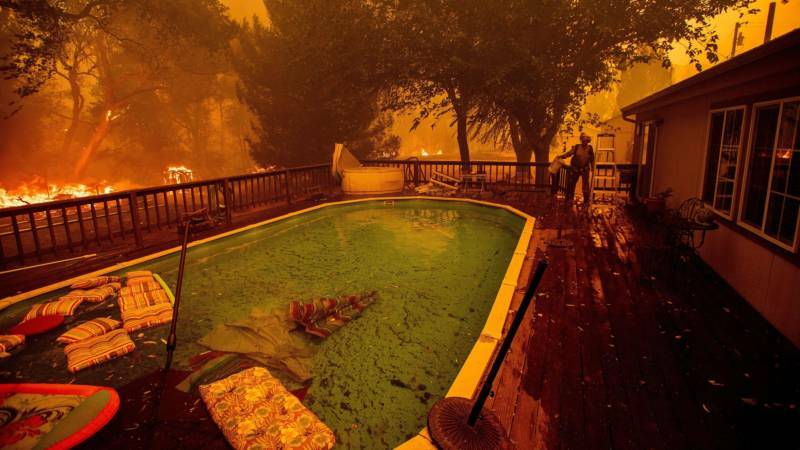 The immediate threat to people's homes has been greatly reduced, Sonja Hutson of member station KQED reports. At least seven people have been killed in that fire, which has burned more than 160,000 acres of land over the past two weeks. Late last week, state fire officials announced that the Carr Fire had become the sixth most destructive fire in California history. Meanwhile, attention has shifted to the Mendocino Complex Fire, which now poses a threat to more than 9,000 structures northwest of Sacramento. It's called a "complex" because it consists of two fires being fought simultaneously, KQED's Hutson explains — the River and the Ranch fires. 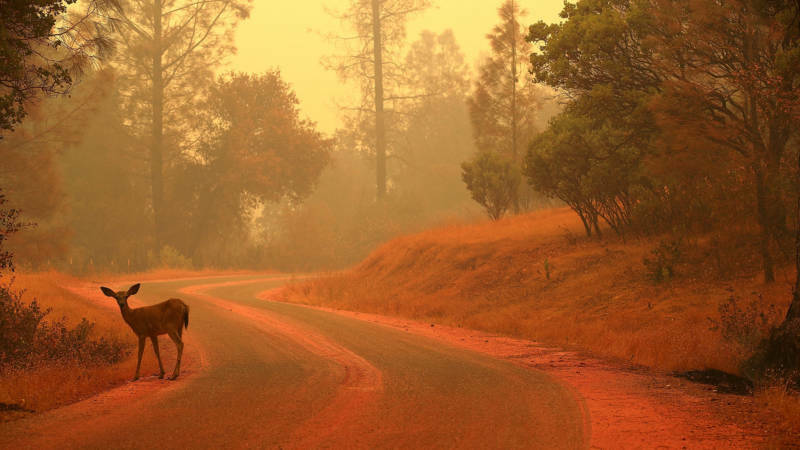 "The fires ... are burning really close together in Mendocino and Lake counties, which are about 20 miles north of the Napa wine country," she tells NPR's Morning Edition. "As a whole, they're 33 percent contained. There's over 9,000 structures threatened and 130 destroyed, so they are very destructive." Debbie Prior leads a horse to safety as the Ranch Fire tears down New Long Valley Road near Clearlake Oaks, Calif., on Saturday. The Ranch Fire is part of the Mendocino Complex. The communities in the region are largely rural and low-income, which makes the fires even more devastating, she says. "There's really a lack of affordable housing in the area, so low-income people whose houses get burned down will usually go to where ever they have friends and family they can stay with in the immediate aftermath of the fire," Hutson says. "And if that's not in the area, they can miss out on a lot of help from nonprofits and the government in getting them back into housing in the area where they have lived for years." Farther south, the Ferguson Fire — burning for three weeks now — has forced the indefinite closure of the most popular part of Yosemite National Park. At the same time, fires are also burning in Idaho, Washington and Oregon. The numerous simultaneous blazes have strained the nation's firefighting resources. Thousands of firefighters are actively working on the ground, and crews from Australia and New Zealand have been flown in to assist.